Over the past 50 years Porte has been building communities and enriching lives through the development, ownership and management of property. We create places where people love to live, work and play and we are committed to strengthening the communities we work in so they last for generations.We are humbled to be able to support people and charities in every location we do business and we are excited to launch our Annual Holiday Food Drive again this year. The Details: With the holiday season fast approaching, Porte will be participating in our annual Food Drive with the Greater Vancouver Food Bank, Surrey Food Bank and Sources Food Bank – we will be collecting food items at all of our residential buildings as well as head office.We are extending this program online by collecting monetary donations. For every donation made, Porte will MATCH it! Even better, for every $1 given, the food banks are able to purchase $3 worth of nutritious food for families. 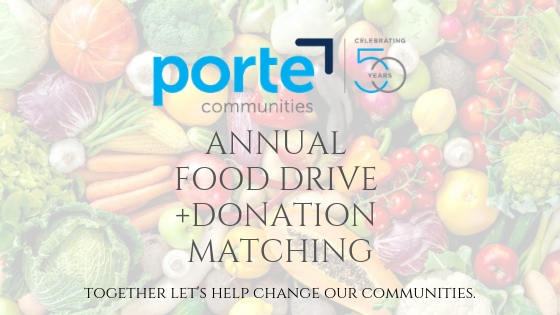 With Porte’s matching donation and the Food Bank’s buying power, your donation will go 6 TIMES as far! Help those in need have a memorable holiday season and donate today! © 2019 Porte All rights reserved.